We are pleased to announce the launch of The i Book of Puzzles. Containing over 100 puzzles, and no less than 28 different puzzle types, there is something for everyone in this delightful collection of puzzles. The book contains a mix of the familiar favourites from the daily puzzle page in the newspaper, containing puzzles such as codewords, word ladders, word wheels, futoshiki, sudoku, kakuro, bridges, minesweeper, wijuko, sudokarrow and more besides. In addition the other half of the puzzles in the book are other interesting puzzle types that do not appear in the published puzzle pages: these include puzzles such as A - Z crosswords, logic teasers, rectangles, calcudoku and various variety / novelty crossword types. The page size is large at 17.8 x 25.4cm, and the print size is large throughout so all puzzles are easy to read, with plenty of space in the boxes for pencilmarks with puzzle types such as sudoku. The book is printed in clear black ink on high quality white paper. 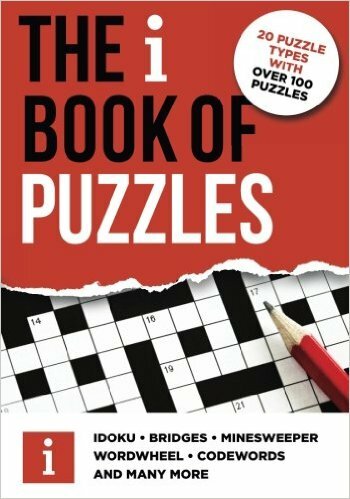 The puzzle book is an ideal purchase for any fan of the daily puzzle page in the i newspaper who would like a stock of puzzles to dip into whenever they desire - whether on the train during the daily commute or to complete at home at leisure. The book would also make an ideal gift for anyone who enjoys the i puzzle page, and indeed for any puzzle fan - with the large mix of number, logic and word puzzles there should be something for all puzzle fans to enjoy. We hope you enjoy the book, and we'd love to hear any thoughts or requests or comments below. Happy puzzling! Buy The i Book of Puzzles.